Our floors were in such bad shape that I thought we may need to replace them. St. Croix Hardwood came in and sanded and refinished. You would never know there had been water stains, my floors look like new. I couldn’t be happier with the results. They are so beautiful that I don’t even want to put rugs down. The crew that came in was prompt and courteous. When they left everything was cleaned up. I would highly recommend St. Croix Hardwood to anyone wanting their floors refinished. 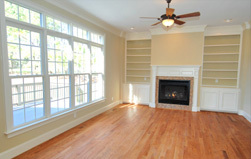 St. Croix Hardwood Flooring is a local, full service flooring company. We have been providing quality craftmanship and outstanding customer service in the Twin Cities since 1998. Hardwood and Pre-finished Flooring installation.